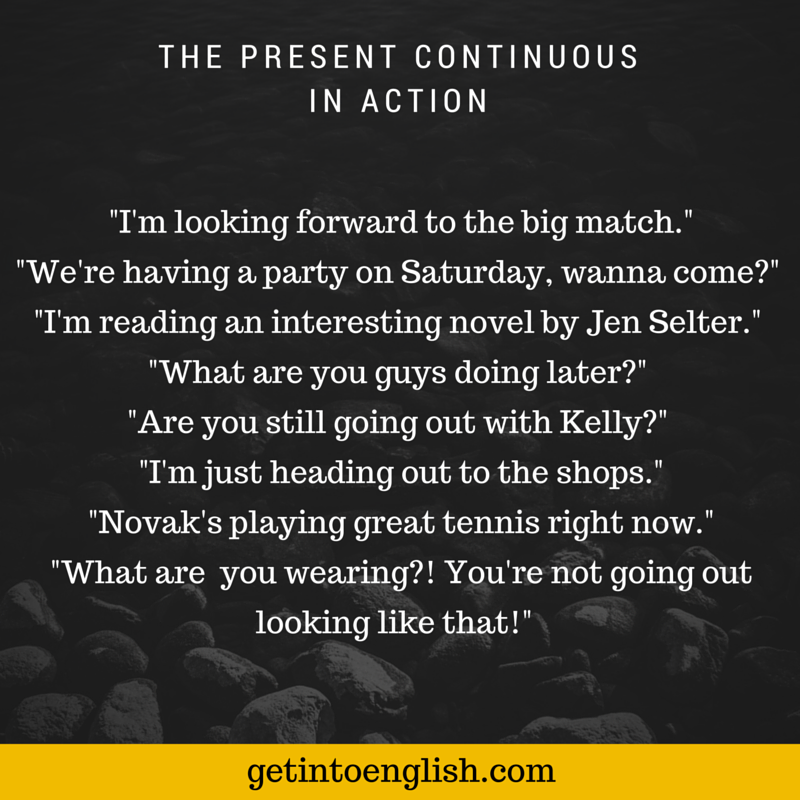 How can you use the verb form that many English coursebooks call the ‘present continuous’ or ‘present progressive’ (ie be + base verb+ing)? Hawthorn are having a great match here today at AFL Park. Hodge kicks the ball to Gunston, who goals! In both these sentences the action is in progress at the time of speaking, but in the case of “Hodge kicks..”, the speaker doesn’t see this as a period of time, but rather a ‘point’ in time. That is, maybe Franklin passes it to Hodge, who then kicks it to Gunston, and then Gunston kicks a goal. These are seen as points in time, so we use the present simple here. So that’s why it’s important to see the event happening as being an action in progress rather than just being a point in time. Hawthorn are having a great match – the speaker sees the football match as being in progress, and knows it’s due to end. I’m sitting at this cafe in Edinburgh..
We’re having a great time here in Belgrade..
Am having a great time at the party. Just getting some drinks, will be there shortly. I’m catching up with John tomorrow. I’m seeing Jitka at 6 o’clock. I’m travelling across Canada next year. I’m not getting up to much this weekend. I’m not doing much later, why don’t you come and stop by for a drink? Trends are a good example of this. Inflation rises when there is strong economic growth – this is a general statement about inflation, and not an action in progress. Everyone’s watching the new Miley Cyrus song on Youtube. The new Samsung smart phone is really taking off. I always catch the bus to work. In the textbooks this use of ‘always‘ is presented as an exception, but actually it goes along with the basic rules mentioned above (ie using ‘always’ with be + base+ing form is not with regular points in time, but rather I am commenting from the viewpoint of ‘being inside’ the moment). From my experience, I’ve heard this from Americans than from speakers in other countries. But I’ve heard myself saying this too in recent times. 15 phrases you can use today! Look, I’m just doing the shopping, can I call you back? He’s speaking with a client right now, can I take a message for you? I’m reading a great little book on the history of Belgrade. I’m studying for my finals so I won’t be able to do much else this weekend. What are you getting up to tonight? (Are) You having a good time? Australia are having a great year, and might even win the next World Cup. I never thought they’d get on, but I’ve heard that he’s seeing Julia. It seems like everyone is watching the big game this afternoon. If you’re heading out, could you get me some bread..? Jimmy’s working hard and making a lot of progress this term. You going to the concert? How about we meet up in front of Shiass Hotel? Things are getting better, thanks. Just coming now, will be there in a sec..
* Credit Michael Lewis for highlighting this. “Australia ARE having…”, it’s plural because the meaning is “Australians”? It’s just like ‘family’ and ‘company’. It depends if you see the team as a single unit (“is”) or a group of individuals. As well, if you’re in the team, you’d say “WE are”..
For us, Brazilians. it is hard not confuse the present perfect with the present continious, because both are used in actions thar start in the past and continues in the present. Is the temporary duration that makes the difference? That’s a really good question. I was thinking of it too when I was writing, but I’d had already written quite a bit. As Michael Lewis writes (btw I recommend his book ‘The English Verb’), it’s also how we see events. I’ve just find a few minutes (hurááá:-) ) and I read your tips about present perfect. I have to say GREAT… Very very usefull tips and mainly very comprehensible explanation. Thanks a lot David! Thanks for popping in. If you’re at home more these days, pls feel free to go over some of the recent posts. Thank you so much for your great work. That’s always easy to comprehend the meaning of all of your posts. In the meantime I’ll have some other posts after Christmas and hope you can jump back on board.